The best way to learn about Betzavta is to experience it. If not possible, the following gives some useful information about the nature of Betzavta seminars. Betzavta is a Hebrew word and means “together”. The title of this method of learning democracy, which was developed by the Adam Institute in Israel, makes up the programme and philosophical background at the same time. The Betzavta method includes a series of workshops, each workshop containing an interactive task or activity, followed by a reflection session afterwards. The goal of the interactive task is for people to delve into their natural patterns and behaviours, while the reflection session afterwards gives an opportunity to reflect on that behaviour. Uki Maroshek-Klarman, who developed the Betzavta methodology, states the goal of Betzavta in the above quote – the recognition of every individual’s equal right to freedom. The Betzavta method makes this concrete, by looking at natural patterns of behaviour and how much each person’s freedom affects the other’s. To what extent do these freedoms infringe on each other, and how much is each person aware of how much freedom they ‘take up’ in a group? Becoming aware of your own behaviour leads a better understanding of one’s own needs as well as the others’ needs. This awareness is the goal of Betzavta activities. In the end of a Betzavta seminar, participants are not morally superior, or necessarily ‘more democratic’. But they are more aware of when they are being undemocratic, or when they take more or less freedom. This awareness is a skill to be harnessed through practice, which leads to better communication and effective decision making. The Betzavta method aims to bring to light dilemmas and conflicts, both in society and in oneself. Often in a conflict, each side believes that they are ‘right’. A dilemma allows you to experience both sides, moving beyond the need to be right or to prove the other wrong. Bringing out the dilemma gives people a deeper understanding of themselves. Participants come to realize things that may have been obvious to others but hidden from their own view (for example: “I want equality, but I don’t really want equality”). Once this is acknowledged, it no longer stands in the way, and the decision making can move forward. 1. Examination of the conflict: clarification of needs. 4. Other democratic (or undemocratic) decision making (example: majority vote). Often when we feel that a conflict *may* occur, we jump to step 4 – making a decision, in order to avoid this conflict. In Betzavta this process is slowed down and examined, allowing participants to become aware of their own and others’ needs and acknowledge them first, thereby making the process more effective and the result more accepted. There are many Human Rights or anti-Discrimination trainings out there that focus on the system and work top-down – what are Human Rights? What is discrimination? Where do these occur in society? What is the function of a democracy, and how can it be improved? There are also personal development or leadership trainings, which start from the self and work outwards – what is my relationship to myself, what is my relationship to others, and how can these things be improved? Betzavta’s uniqueness is that it combines the personal and the political, acknowledging that there is an individual in every group process and allowing for a ‘bottom up’ approach to learning. The themes are rooted in democracy education, but the individual is challenged to come to terms with their own dilemmas. This combination of the personal and the political is what is needed to affect society – an awareness of oneself in order to work together in a group and make positive changes in society. The role of the trainer(s) in a Betzavta seminar is unique, in comparison with other trainings. The trainers are there to facilitate and guide the discussion, and to challenge participants on their role in the group process. However, the group is given the freedom to regulate itself, thereby challenging people’s notions of authority and responsibility. For example, there is the common dilemma of “we want to do what we want, but we want to be told what to do”, or “I want a leader, and I don’t want a leader”. This puts the responsibility in the hands of each participant and lets them figure out how to manage their own group. This leads to a very experiential learning process, where every person is made to come to terms with how responsible they are, what their ‘role’ is in a group, and how it affects the others. 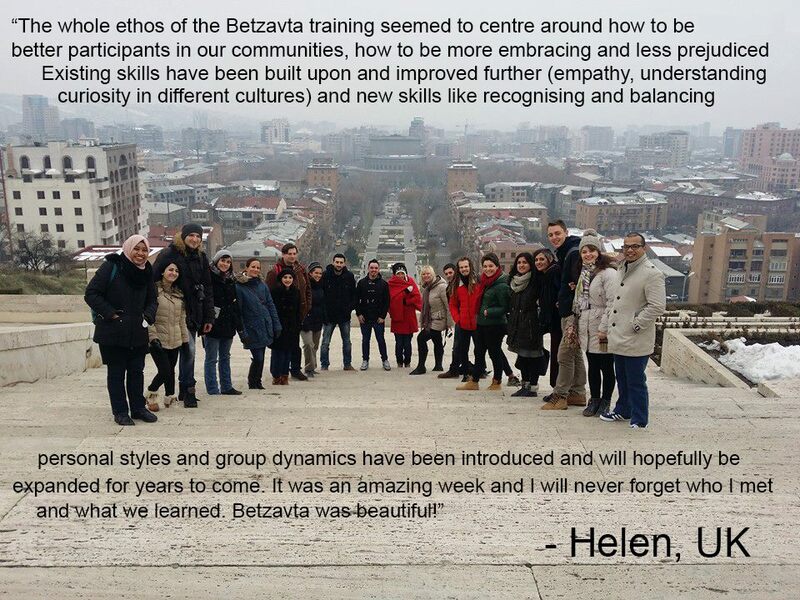 Every Betzavta seminar is different, as it is given by the dynamics created by the participants. Every group has different needs. Therefore, the conversations in every seminar are unique and drive a process that is relevant towards the given group. The framework of a Betzavta seminar is thoroughly prepared by the trainers, but timings and themes change according to each group. Therefore, Betzavta trainers must stay very present and always listen to the needs of the group – whether these needs are apparent or hidden. This makes each Betzavta seminar especially relevant and allows participants to practice being present and aware.